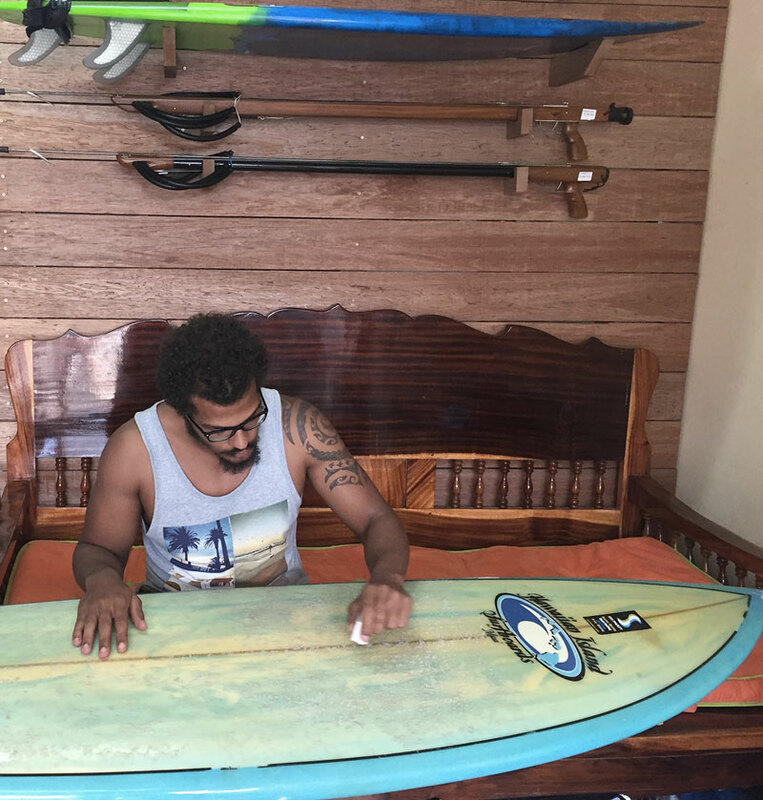 Put your skills to practice and rent a surfboard in Phuket. For experienced surfers, you would have access to fiberglass boards or in epoxy, shortboards, long boards and the Malibus! The standard dimensions of the competition boards are: size 5,8 for short boards, and 9,6 for longboards. If you want to rent a surfboard, it is important to know some basics first. We would advice you to take up one lesson to understand the some basic rules and to learn basic techniques and you would be able to rent a surfboard and go surfing solo. At SSS Phuket, we have experienced instructors to provide lessons. Be attentive to the weather forecasts is essential in the practice of the surfing in Phuket, as everywhere else. Indeed, it can make the difference between a pleasant surf session with good sensations, and a less interesting session where it is difficult to take some pleasure. Then to optimize your surfing session in Phuket, do not hesitate to consult the presented links, appropriate to every spot, which will help you for sure in your surfing session in phuket ! 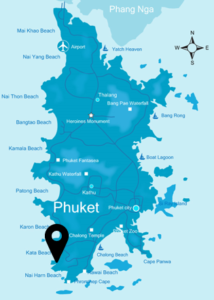 In addition, you will find all the weather forecasts details you need to surf in Phuket. Furthemore, keep you up to date in real time about weather conditions of every spot, and will indicate you what is the ideal moment to practise the surf in Phuket, no matter the spot you have chosen ! How to well apprehend the sea before a surfing session ? Firstly, it’s essential to know the various elements of the environment with which, as a future surfer, you are going to live with, during your next surfing session. The dominant element for the birth of waves are: the depression, the wind and the swell. First and foremost, a depression is the origin of the training of waves, because it’s going to generate the swell on the coast which is going to propagate in a linear way, and this thanks to the wind. But how ? It going to depend on the duration and the horizontal distance on which the wind blows, what is going to generate micro-undulations, ripples, then create lapping, and finally waves. This distance also bears the name of “Fetch”, so we shall speak then about length of Fetch. At this moment, the wind is the only contribution of energy on the surface of the water, thanks to its strength. Consequently, the transfer of energy is obtained by the deformation of the surface of the water and the constraint exercised on this one. But other factors can also influence the swelling of waves: sea currents, tides, or even the interactions that waves can have between them. The swell is the consequence of the strength of the wind + the distance (“Fetch”) + the time during which one it blew. This zone of interaction between the surface of the ocean and the wind engenders then a train of swelln which can propagate in any direction and reach the distant coast. But other elements can be at the origin of the growth of waves, before coming on the coast, as the height, the period and the direction of existing waves, the strength and the frequency of the gusts, etc. -The spot: It’s the practice site. We use is in surf, as well as for freediving or kitesurf. -The offshore wind: it’s a wind coming from the land to the ocean. This orientation of the wind is the ideal orientation. -The on-shore wind: it’s a wind coming from the ocean to the land. Contrary to the off-shore wind, It’s going to make only flatten waves and the water, what will not guarantee good waves to be surfed. same on the opposite side. And the amplitude of tides varies according to the position of the Moon, the Earth and the Sun. So, tides are more important when three stars are in the same axis. This is the way that before a surf session, it’s important to check if the tide is rising or going down. It can largely influence the quality of waves, and the currents can be different, or the waves which can be very changeable according to the spot (if it’s a beach break or shore break or another reef break). -The tidal coefficient: it’s the difference of the water between the high tide and low tide. Consequently, the more the coefficient will be raised, the more fast and constant waves are going to be. The ideal coefficient would be between 50 and 70. -The ocean current: The ocean current is an horizontal movement of the particles of the water in a determines direction, a certain speed and diverse properties of temperature and salinity. a spot and know how to recognize them in order to adapt its practice to its level. Indeed, waves are born and are going to break out differently on each spot, depending on their nature: they can be composed by sand, rocks or corals. Then born the refraction phenomenon: that is the curvature of a wave which moves according to the depth of the spot, the place where it breaks out. The more the surface of the spot is deep, the more fast the wave will be. -The beach break: they are beaches of pebbles or sand, characterized by sandbanks thanks which one waves break in right or in left, and can re-form quickly. This kind of spot is ideal for the beginners because in case of fall, they do not fall on rocks but on sand. These spot are also more accessible to all, because waves are less hollow because of sandbanks. -The point break: on these spot, waves break on the sand and on rocks. The difference with the Beach break, is that waves always begin at the same place, which is often a rocky point or a pier. The particularity of waves is that they unwind longer that on the other types of spot. But the ream turns out longer to reach the peak. an be really sharp, and it’s possible that the leash catches on rocks, which can cause drowning. But it exists many other reef spots which are not as dangerous as Teahupo’o (French Polynesia, Tahiti) or Pipeline (Hawaii). Waves there are bigger than on beach breaks, and the reef breaks can even form some barrels or rollers. You are now informed on everything you need to know to appreciate your surf session in Phuket and the nature which surround it. It’s by knowing well the environment in which we can surf, that we can progress in total safety ! The priority. When someone is surfing on the wave or paddling faster than you towards the peak of the wave, this person has priority over you. Check the wave regularly to see if someone is already surfing on it. For safety reasons, do not paddle if someone is already paddling. Never put your board in front of you. Waves can be violent. Thus by not putting your board in front of you, you would refrain from any unnecessary accidents and serious head injuries. Always try to control your board. Before releasing your surfboard, always check around if there is someone. For safety reasons, it is always advisable to keep one hand on the board to have control of the board. Avoid putting yourself and others in dangerous situations. If you think that the conditions are more than you can manage, do not push for it as you may risk landing yourself in a life-threatening situation. If you have not surfed for a while, it is advisable to to take up one lesson just to get the momentum back. As you would learn during your surf lesson, surfing requires a fast reaction time. Between each wave and depending where you are situated, you have to be on the ball and think fast what you would like to do. If you are paddling out and you see a surfer who caught a wave and coming towards you, keep paddling out. Do not stay stuck in the middle because it is extremely dangerous should a collision occur. Like in every sport, respect is key to enjoying the activity. For surfing, there are some areas with a strong local presence where foreign presence may not be appreciated. In this case, be respectful and understand the culture better. As such, the locals would be more than happy to welcome you. Surfing is a rigorous sport which requires a lot of energy. Warm up your muscles before you go surfing, it would help you to be more at ease in the water while reducing the risk of injury while surfing. Loosen those muscles and be ready for a great surf session! There are different kinds of boards catered for different activities. Surfing, longboard, stand-up paddle, body board and fun board. Each activity requires a different type of board. The board is defined by its length, width and depth. It started in the 70s and had developed over the years. The highlight for this board is the rocker which makes it possible to surf in critical sections of the waves. 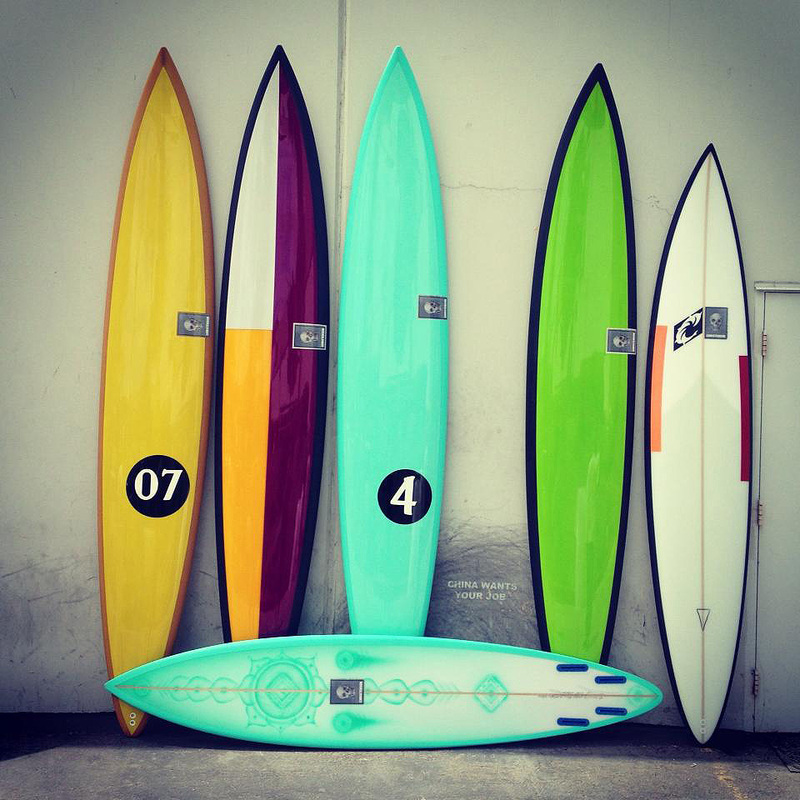 The length of a shortboard ranges between 5’4” to 6’8” and the width ranges from 16” to 20”. 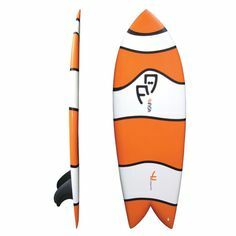 Normally, shortboards have 3 or 4 fins but it can also be used to surf with 1 fin (singleboard). The single board is suitable for advanced surfers as it is more difficult to paddle and less stable. The Gun is the one which surfers use to catch big waves. The measurements are between 7′ to 10′. It has a pointy nose and a pin tail. It is possible to gain a lot of speed with the Gun because of its shape and size. Surfers can expect to take big drops and high speed in the waves. It has good control even in high speeds. Well known in the 70s. This board has a rounder nose and a swallow tail. It is smaller compared but wider compared to the short board. The length ranges between 5’2” to 6’5” and the width from 18” to 24”. It has generally 2 or 4 fins. 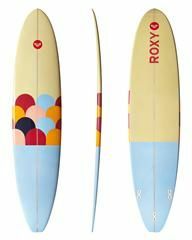 It is quite flat with a slight rocker to make paddling easier in smaller waves. It also helps the surfer to gain speed even when the wave is not powerful. The Fish are generally used in small to medium sized waves. A surfer could do the big carve with it ! The longboard is the original shape of the surfboard. Created in Hawaii, it was made of wood in the beginning. Today, longboards have lengths between 8′ to 14′. It has a round nose and can be used with 1 big fin or 3 small ones. Longboard has greater stability with easy paddling which makes it easier to catch waves. This is the board that is recommended for beginners. It is hard to pull sharp turns off with the long board but the surfer would be able to manage hang fives or tens. Longboards used to be called Malibu. However there are some slight differences between the Malibu and the longboard. The Malibu is slightly smaller and has a slimmer tail compared to the longboard. Thus, the Malibu allows more radical turns. 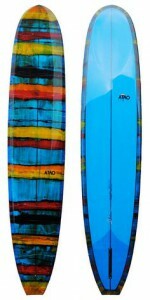 There are smaller variations of this board called ” mini-Malibu’ with the same riding characteristics. A funboard is hybrid between a short board and a longboard. It is bigger than a shortboard but has less volume than a longboard. The length starts from 6’5” to 8′. You can find a diversity of shapes for the funboard. This is recommended for surfers looking for paddling power, stability and something smaller than a longboard. This is good for all kinds of conditions and for less experienced surfers. The choice of your surfboard is important for you whether you are an amateur or pro to ensure an enjoyable surfing session. As a beginner, you should start out using foam boards, longboards or funboard. Paddling would be made easier and the volume of the board would provide sufficient stability and power to catch the waves. Those boards are the most available when you want to rent a surfboard anywhere. As an intermediate surfer, you could attempt smaller boards, as you would be more ease following waves and making turns. The smaller surfboards would allow you to maneuver easily. Some options you could consider would be a shortboard taller than 6’4’’ or a Malibu. As an advanced surfer, you would be chasing higher performance. You perform tricks and the board becomes an important component of your surf. The board you choose would be based on the wave conditions. This means that if you surf a reef or a beach break, your choice of board would be different. For instance, if you surf a reef break with waves around 1 meter you would probably choose a shortboard around 6′ with a round tail which would be a complement to the medium high waves. To conclude, the choice of your board is dependent on your level as a surfer and the size of the waves. The rougher the conditions, the bigger the board should be in order to provide you the stability you require. The rocker of the board is the curviness of the board. You would require a flat board take on the smaller waves with high speed. Also, the shape of the tail is essential and for powerful and hollow waves, a small tail would give you more control. 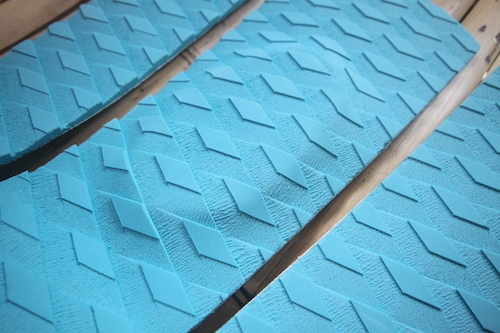 Clean your surfboard as the new layer of wax would be able to last longer. (You would not have to do this for a new board.) You could use a wax comb to remove the layer of old wax and use a commercial solvent if there is some remaining old wax. Apply the first layer of wax with a basecoat wax. The basecoat is important, as it would remain on the board once you are done surfing. The basecoat is harder than other wax. It allows your wax to last longer. You could apply it either by drawing circles or applying it horizontally and then vertically. 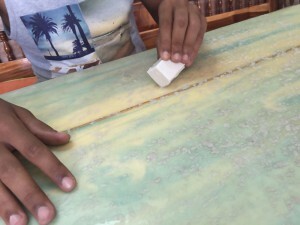 Finally, apply the top coat of your wax on your board. There are different types of wax used for the different water temperatures. If you use a cold water wax for warmer waters, it would be too “soft” for you to surf. The top coat must be applied before every surf session. A rule of the thumb: Remove the wax of the board once every 2 months for optimal maintenance. Generally, you remove the wax of your board every two months. Surfline or Windguru just to name a few. These websites will give you useful insight on the surfing conditions. Information on the size and direction of the swell and the tides can be found. Not forgetting the weather conditions and the wind speeds and direction. To illustrate: when you see that there would be waves of 1 meter with a frequency of 10 seconds and offshore wind, you should foresee a good surf session. The tide should also be taken into consideration as it would affect the shape of the waves, which would eventually affect the surf quality. If conditions are not favorable for surfing, it is always possible to go stand up paddle. 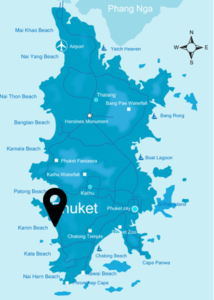 Where to surf in Phuket ? 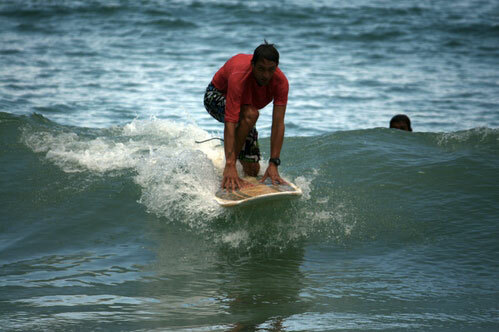 Why not having your first surfing lesson in Phuket with SSS Phuket ? Come and take your first surfing lesson in an idyllic scenery, between white sandy beach and turquoise water ! In contrary to what we could believe, it’s well and truly possible to surf in Thailand, and more exactly on the beaches of Phuket ! Some surfcamp are even available with SSS Phuket ! The high season is suitable to sunbath on the beach and to appreciate the peace of the ocean, whereas the low season lends itself volontier to some agitations of the sea, for most great pleasure of the surfers who ensure a “Phuket Surf” atmosphere. 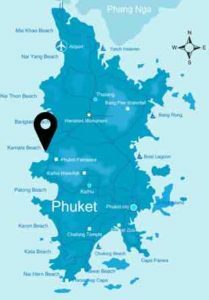 Even if Thailand is not the most famous destination known for a surf trip or as “Phuket surf”, Phuket island, in particular the west coast, has an orientation which allows to benefit from a swell coming from the west. 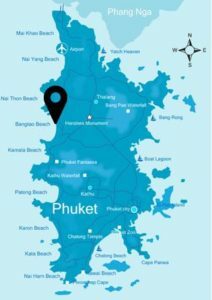 The region of Phuket is protected by a the swell coming from Indian Ocean, from Sumatra island (to the south of Malaysia) by the sea of Andaman which surrounds it and by the archipelago of Nicobar islands, in the east of Indian Ocean. 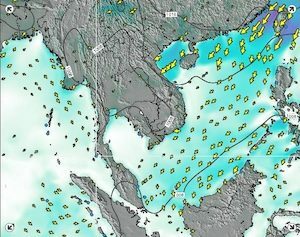 A swell coming mainly from the North of Sumatra islands allows the birth of waves at the level of Phuket. 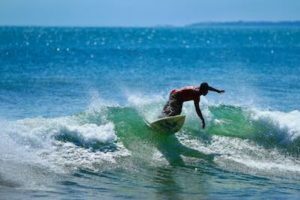 Therefore, these waves are very frequent from May until October, even sometimes in November, which is the “dry season” in Thailand at this moment, and so it’s absolutely possible to go surfing in Phuket during this period. Then, the swell arrives thanks to winds stemming from the monsoon which can produce waves being able to go to 2 meters. 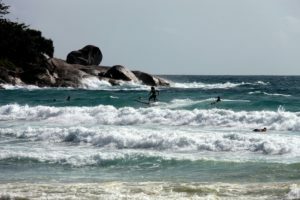 These waves can be ideal to begin the surf in Phuket, as well as for the most experimented, who are going to have the choice for the surf spot. Kata Beach spot is the place where majority of surf classes in Phuket take place because, as a sand beach,waves are accessible to beginners, and will fit to the most experienced surfers. For your first surf classes in Phuket, there is no such thing as a friendly atmosphere and a paradisiac context ! Kata beach is one of the most popular beaches of Phuket after Patong beach and Karon beach. This long white-sandy stretch is bordered by a real turquoise sea which is one the most beautiful beach of Phuket. If you prefer to go surfing in Phuket by yourself without monitor, you could easily rent a surfboard nearby a few surf shops situated at Kata beach and on the beach, real vectors of Phuket “surf vibes”. 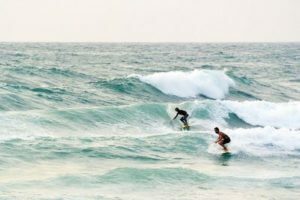 Furthermore, the waves are very different every day, which could allows you to use as much a shortboard as a longboard during your surf trip in Phuket ! The offshore winds (winds which come from the earth) slow down the winds from North-East, which permits the birth of right-breaking and left-breaking waves. The best swell on this spot is the one from South-West. This is also a very animated and lively beach because the famous surf brand, Quiksilver, regularly organize some events which gather surfers and varied public, like competitions and animations to allow all the world to discover the surf in Phuket ! About the weather conditions for Phuket surfing, at Kata beach, the offshore winds come from the North-East, and the tide doesn’t affect the quality of your surf session in Phuket ! But don’t forget to check the weather forecast to optimize your surf session in Phuket. Karon is sandy-beach, where waves are constant in low season. That’s in this spot that you could be sure to practice surf in Phuket ! The ideal conditions for this spot is the association of East winds and a South-West swell, which could create some good left-breaking waves. This spot is not really busy in general, which makes it as one of the most accessible surf spots in Phuket. 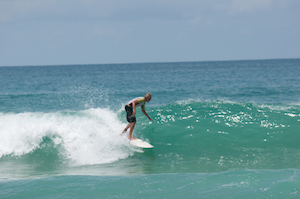 The beginners and amateurs will be completely satisfied on this surf spot of Phuket. Karon is also a “idleness” beach really enjoyed by families thanks to the calm all day long and to its long extent letting some space for everybody (4 km-long beach), in contrary to Patong or Kata beach, very more animated by night. This is one of the numerous beaches in Phuket (as the one of the most important island of Thailand kingdom) which attracts a lot of tourists every year. Even called as the “Pearl of the South”, this beach truly reflects the disorientation that tourists are looking for when they come in Thaïland. Less busy than its neighbour Kata beach, the Kata Noi beach will delight your wishes of surf in Phuket. Rarely crowded, the sea is particularly clear and even if the natural shadow of trees kindle desire on the beach, its idyllic setting will charm you ! West facing oriented, the sun exposure is almost permanent there. This way, your surf session at Kata Noi beach will be for sure, sunny. 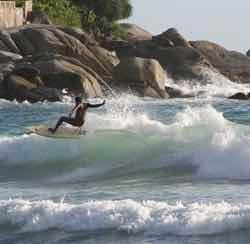 Theperiod the most favourable to ride great waves in Kata Noi is to May from October. Recommended winds for this surf spot are offshore winds from West. At least, the part of this beach the most adapted of Phuket surf is the north part. You could practice with pleasure the surf in Phuket in this beautiful bay, situated on the south of Kata beach spot. Really easy to access. Enjoy your ride ! are more at the north of the beach, that could also create a big sandbank, making birth to a quick left-breaking wave. Furthermore, this spot could really surprise you by the size of the waves sometimes, which can be amazingly big during huge swells. Surin beach is an enjoyable beach, bordered by a dozen of restaurants which propose thaï specialities. It’s less busy than beach on the south of Phuket, but there even was some constructions for the improvement and maintenance of the place. This beach and its town has a lot of charm. Next to Surin beach, is located the long beach of Bang Tao, a 8-km long sandy beach. It’s possible to access passing by the “Laguna Phuket” hotel, situated 2 km at the north of the small Surin‘s town, which occupy the majority of the beach. At the south of the beach, there’s a small fishermen village where you could find some hotels and guest houses with real reasonable prices if you decide to come for surfing Phuket. In the same place, are several paths to access to the end of the beach (on the south), which is besides a protected part of the beach from big swells thanks to its orientation, with ideal waves for beginners. So this is on the south of Bang Tao beach where you could easily learn how to surfing Phuket. Still during dry season, this spot can be really feasible when a swell from West and a West-south-west are associated. Some good right-breaking and left-breaking are waiting for you there, but be careful with some rocks on this beach. This way, the biggest waves come into being on the center of the Bang Tao beach, because this part is more exposed to winds and the move of the sand banks could create sometimes bigger waves, even impractical waves. This is a calm beach, little busy by the tourists. 15 minutes north from Patong beach, is situated the Kamala beach. Like a quiet fisherman atmosphere is reigned here, but this is changing and becoming a dynamic town thanks to new bars, restaurants or guesthouse which attract some tourists. But there is still a relaxed and chill atmosphere. If you are coming from Patong, if you take the first path on the left at the end of the hill, you’ll arrive at a little bridge, where there will be after it, two little beaches a little remote. Those beaches can be perfect for snorkeling or just laying on the beach. Then, you could even see from this place, some others surf spots next to Kamala beach. Also, you will see from a headland there, a point break where you could surf during half-tide and with a 1 meter swell. You’re also going to love some other places on the north, if you take the main road, where you could easily go thanks to traffic signs along the road. Whose one at the end of Kamala beach, which is a sandy beach with some reef points. Here, the waves are constant and could be really good with a 1 or 2 meter swell. 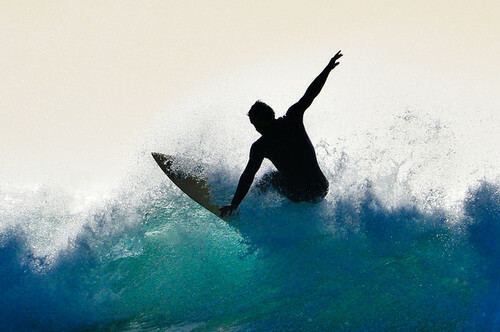 During less important swell, waves can be perfect for beginners and surf classes in Phuket. Therefore, Kamala is a beach which combines some spots more or less busy, for all different levels. To surf in Phuket at Nai Yang spot, consult the weather ! This reef break spot less known in Phuket can really be amazing, in particularly during low tide, where your surf session in Phuket can be good. 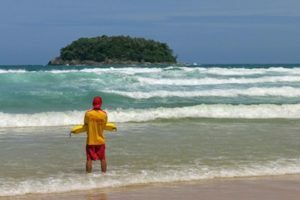 Even if this spot requires a bit more to paddle than the other surf spots in Phuket, it could offer different pleasant points to take some good waves that can break at the reef, towards wind and swell direction. On this spot the reef can, during half-tide, allow to form some waves by ejecting it at the top of the reef thanks to power tide. When good conditions are here, with an offshore wind, early in the morning can take shape some clean and glassy waves, which unroll on a long distance. 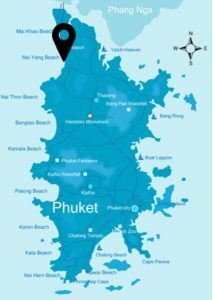 But be careful, if you decide to surf in Phuket at this beach between November and February, you’ll risk to not be the only one on the beach. Indeed, at this period, some sea turtles come on the beach for laying its eggs there on the night, mainly on Mai Khao beach (at the north of Nai Yang beach). Those areas are very protected by the authorities, you could watch it by far of course but it’s forbidden to approach it. Finally, don’t forget to keep the beach clean because the 2 beaches take part from the Sirinat National Park. Please respect that. This way, coming for surf in Phuket let you a great choice about your spot for practice or discover !